Registration and packet pick-up will be available near the start line race morning for those who absolutely can’t pick up their race bib/chip on Friday or Saturday. We strongly encourage participants to pick up their race materials prior to race morning. There will be an additional $10 fee for bibs picked up race morning. The Start Line is located on 41st Ave near the intersection of Portola Drive at 816 41st Ave Santa Cruz 95062. 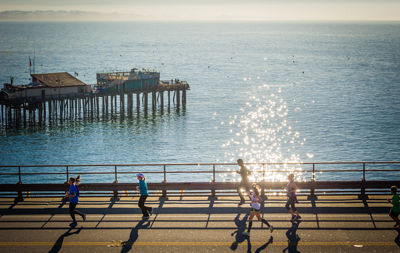 The Surfer’s Path 10k/5k courses are designed to maximize coastal views and offer optimal turn around locations. To accomplish this, the start and finish areas are set in two locations, less than a mile apart. We recommend parking mid-way between the start and finish and enjoy a short pre-event warm up and post event warm down. There is plenty of free, on-street parking between the start and finish areas. If you are planning to be dropped off near the start line, drivers can continue to Capitola Village parking lots above Capitola Village and the Finish. Access to Beach and Village Parking Lots 1 & 2 (Upper and Lower) is on Capitola Avenue, Bay Avenue and Monterey Avenue. Parking costs for these lots is $0.50 an hour and you can pay for up to 12 hours. There is NO PARKING in business lots located along 41st Ave between Melton Street and Court Drive, and on Portola Drive, between 36th Ave and Adriene Way. Vehicles will be subject to posted parking restrictions at these locations. The Finish Line is located at the corner of Esplanade and San Jose Ave, at 203 Esplanade in Capitola Village.